1) Dress shank down to above the barb. 2) Tie in the ribbing. 4) Wrap the dubbing forward forming a tapered body. Leave enough room for the hackle and head. 5) Wrap the Ribbing forward through the body in the opposite direction. Tie off. 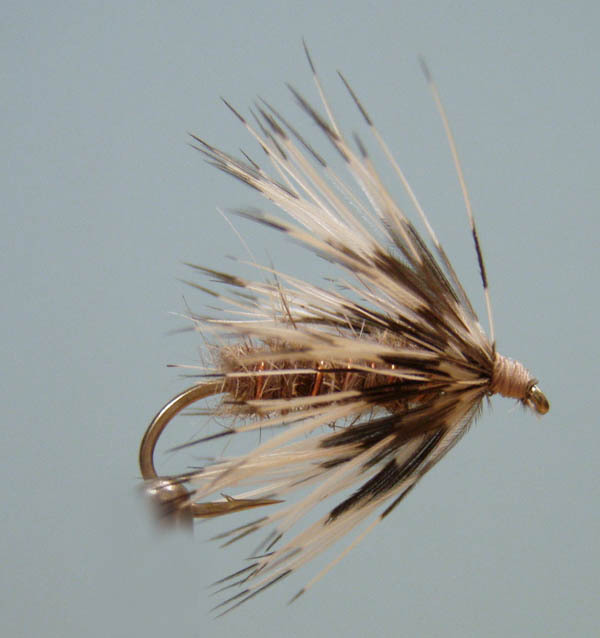 6) Prepare the feather by clamping the tip in hackle pliers. Then (with the small finger of the right hand in the hackle pliers loop and the left hand holding the feather taught) with the shiny side up using the thumb and fore finger of the right hand stroke the fibres down and back. Repeat the process until the fibres on both side of the quill are against each other. 7) Remove hackle pliers from the feather and tie the prepared feather in by the tip with fibres facing back and the quill vertical. 8) Now wrap the feather in 3 or 4 close wound wraps forward toward the hook eye and tie off. 9) Form a neat thread head, whip finish and varnish.